The Guaranty Trust Bank (GTBank) plc has launched its more first fully mobile friendly banking application known as GTWorld, just as the Managing Director and chief executive officer, Mr Segun Agbaje described the new product as a one-stop mobile application, reports ITRealms. 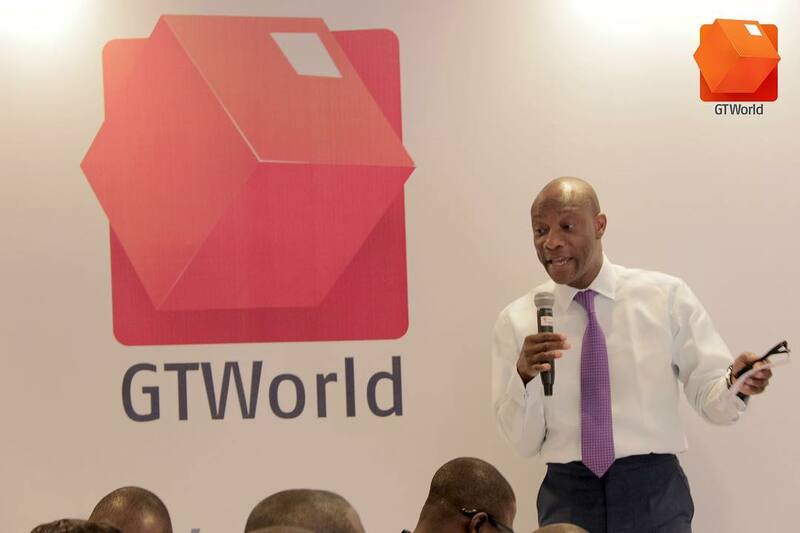 Unveiling the new GTWorld at GTBank head office in Lagos, Wednesday, Mr Agbaje, told ITRealms, the app offers most of the things people could find in a number of different apps thereby reducing the number of mobile apps customers could install in their mobile devices. “GTWorld is a mobile banking app that is designed to cater to all that’s important to customers easily and seamlessly,” he said. This, he told ITRealms was built on the back of the bank’s customer-centric digital strategy, and thus, GTWorld is available for download from the Google playstore for Andriod phones and Apple Store for those using iPhones. He explained that GTWorld has 12 distinguishing features comprising signing up for an account opening with or without Bank Verification Number (BVN) to be followed by retrieval of online details. Customers on the go, he advised, could quickly access balance, own transfer, airtime, GTlocate, GTBtraffic, iReport, and socials among others. Agbaje who was accompanied by some of the management team pointed out that its possible to login with electronic mails (emails), fingerprint, facials and password with GTWorld, just as there are features for transaction authentication with fingerprint, bills history payment could be called up, statements to embassies and other 3rd parties as well as transfers via phone. In addition, the chief executive officer of GTBank told ITRealms that calls to and email GTconnect from the app have been streamlined for a better customer experience, while cardless withdrawals on GTBank and other banks Automated Teller Machines (ATMs) are available. The mobile banking app, he said, offers customers access to more than 90 per cent of the bank’s services on their smartphones and guarantees further security through biometric authentication and end users convenience through the Quick feature, which enables a user to perform transaction without signing in among others. According to him, when switching to GAPS-Lite, the app offers small business owners access to real-time monitoring of all transactions and the ability to make bulk and single transfers on the go to any account in the world. The most significant frustration needs to be the irregular top. Dremel Shaper/ Router Table Review If you wish to make the most of the room energy of your router table. Therefore suppose we begin utilizing the ADP portal login of prepaid cards to earn the online payments. ADP Portal And so as opposed to the incomes, these cards are handed out. Daytime temperatures stabilizing in the mid-thirties here in the second week of the month. Yet the heat is expected. Thanks a Lot for Share Great Blog.